Cinco de Mayo is just a shot glass away. What does that mean for dreamers and drifters in the City of Angels? Three million (approximately) fun things have been crammed into/scheduled for this weekend. Luckily, you’ll still have plenty of giddy-up and Go Go from that Easter cocktails candy sugar high you’re still riding…. There are bigger photo fests in town this weekend (see More Weekend Go Go Fun round-up below) but the inaugural Photo Independent Art Fair promises to pack quite a wallop for its comparatively small size. That’s due to the Fair’s laser focus; 70+ exhibitors/independent photographers from around the world — over half from the Southland — will interact directly with influential taste makers as well as the public. You’ll want to make sure you’re one of those groups. For those who like a little glam with their glossies, Andy Summers, formerly of The Police and an active photographer since 1979, is Photo Independent’s Honorary Guest for 2014; his moody, atmospheric Mysterious Barricades is the Art Fair’s special exhibition. Additional highlights at the Fair, which is presented by Fabrik, include: Fearless Genius, Doug Menuez‘s intimate, behind-the-scenes look at a post-Apple Steve Jobs and his team, and local exhibitor J.T. Burke‘s exquisite digital collages. Guest of Honor Summers will also attend the Friday Opening Night Premiere Preview and Party: a benefit for Los Angeles Art Association. The premiere also features an interactive performance by performance artist Tiffany Trenda, video installations from the cutting edge Los Angeles Art Collective, and music by KCRW’s Raul Campos as well as organic whisky tasting courtesy of Koval Distillery, and tipples from Dark Horse Winery and Angel City Brewery. It’s important to toast the art. PHOTO INDEPENDENT ART FAIR — Opening Night Premiere Preview & Party Fri, April 25 7 – 10, Sat April 26 11am – 7pm & Sun, April 27 11am – 6pm. 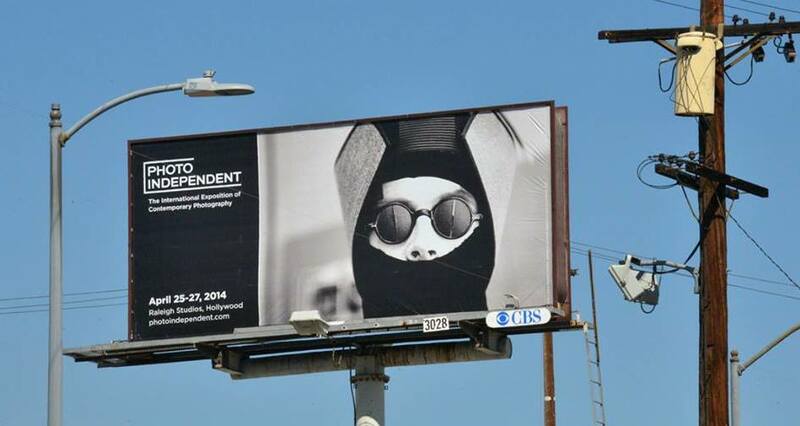 $15 – $100 — Raleigh Studios Hollywood, 5300 Melrose Ave, LA 90038. More info HERE. Buy tix HERE. See how the art half lives. Art lives at The Brewery and he’s throwing a hell of party this weekend. Ms. Go Go kids, of course. In this instance, art isn’t a person but the creative blood, sweat and tears of 100+ people occupying the live/work spaces in the former Pabst Blue Ribbon Brewery on the outskirts of Downtown L.A. During the FREE, two-day, twice-a-year Brewery Artwalk, artists open up their studios to the public for viewing, conversation, and purchase directly from the artist. Also known as a win/win situation. But while art may live at the Brewery, there are lots of fun party guests. Play smart with the madcap brainiacs/fun engineers at Two Bit Circus. Be astonished by performance poet Brendan Constantine and fellow silver-tongued friends at ‘poetry read aLOUD’. Or for a uniquely interactive experience, visit the House of Sloth, which will be demonstrating Mitzella’s Steampunk Hardwares including the “Dreammachine” whose flickering light induces a pre-sleep state in the viewer. Here’s hoping the exhibit includes a Steampunk Napping Couch. BREWERY ARTWALK 2014 — Sat, April 26 & Sun April 27, 11am – 6pm. FREE — The Brewery, 2100 Main Street, LA 90031. More info HERE. If you’re hooked on Chopped, a slave to Iron Chef or have a sweet spot for Sweet Genius, you’ll definitely want to cancel all existing social obligations and grab tix to the Los Angeles Mac and Cheeze Takedown. It’s like MasterChef without the Russian cod liver or the rambutan. The “sMACdown” (See what Ms. Go Go did there?) ia also sans Gordon Ramsay. Instead, you get hilarious Matt Timms, the anti-Ramsay, who not only created The Takedowns — various cities have hosted Takedowns highlighting bacon, cookies or tofu — but hand sews wacky pillow creatures and hosts a hot trivia night in a Brooklyn bar. But here’s the best part of The Mac and Cheeze Takedown. You’re not just a spectator, you’re an active participant who gets to sample all that ooey gooey goodness. Even better, your Sunday afternoon food coma benefits the Women’s Education Process. The only thing better would be eating in your footie pajamas. Not that anyone’s stopping you. 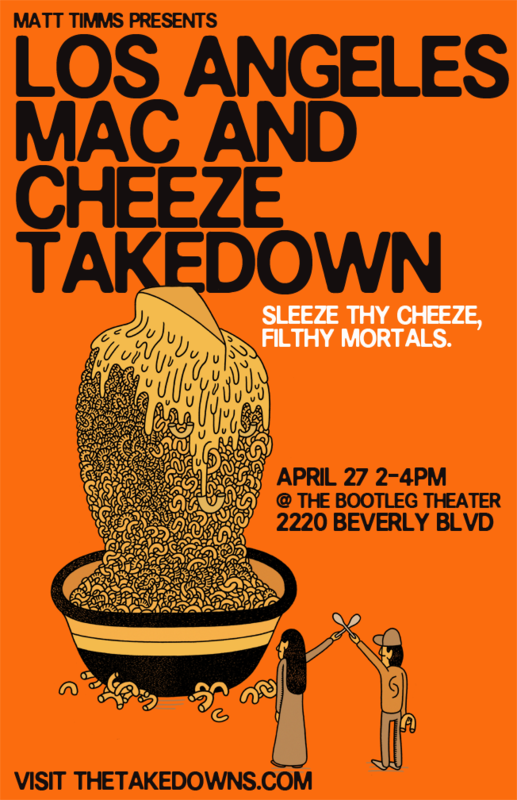 THE LOS ANGELES MAC AND CHEEZE TAKEDOWN — Sun, April 27, 2-4pm. $15 — THE BOOTLEG THEATER, 2220 Beverly Blvd, LA 90057 Get tix HERE. Ready? U Know U Want 2 Go Go ….